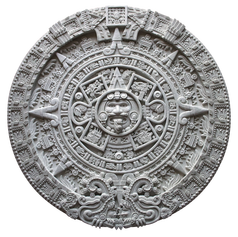 ﻿"The Aztec calendar is the calendar system that was used by the Aztecs as well as other Pre-Columbian peoples of central Mexico. It is one of the Mesoamerican calendars, sharing the basic structure of calendars from throughout ancient Mesoamerica. The calendar consisted of a 365-day calendar cycle called xiuhpohualli (year count) and a 260-day ritual cycle called tonalpohualli (day count). These two cycles together formed a 52-year "century," sometimes called the "calendar round". The xiuhpohualli is considered to be the agricultural calendar, since it is based on the sun, and the tonalpohualli is considered to be the sacred calendar."